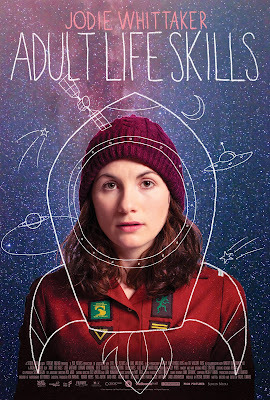 This is a slightly modified repost of my Tribeca 2016 review of ADULT LIFE SKILLS which is getting a US release tomorrow because Jodi Whittaker is the current Dr Who. My over riding thought five minutes into ADULT LIFE SKILLS was this is the prototypical Tribeca Film Festival comedy - its a bunch of quirky characters, doing quirky things with a hint of romance and a touch of sadness. It is, as all prototypical Tribeca comedies and many inde films are, straining to be unique. And while it manages to do so in the details, it's very much of a type and like a hundred or more other films that are really good for the 90 minutes they are on, but completely forgettable once they are done. Don't get me wrong it's not bad but it isn't anything special, largely because it's trying so damn hard. The plot has Anna trying to get over the death of her twin brother a year and a half before. As she careens to her 30th birthday her mother wants her out of her shed in the back yard, the little kid next door has latched on to her as a surrogate mother and a cute guy she thinks is gay, but actually has the hots for her, has come home to write his novel. There's more including a fascination with penises and mole holes but you get the general idea. Its well acted and well done technically. If there is a problem its that a good number of the characters don't have much to do. I think part of it is the result of a bit too much not being explained. What exactly happened to the brother for example. I ask because he's always in scuba gear when Anna sees him. And where does Anna work, its some kind of camp but it's not clear. Trivial I know but at the same time I'd like to know. If you like comedies and don't mind it slipping out of you mind when it's done give this film a shot.